In all the years I have spent in this business, this is the only one of these clocks I have seen so they must not have been made in any substancial amount. However, they did make enough to warrant Pratt having labels printed just for these clocks because it specificly says “ALARM TIMEPIECES” and gives directions on how to set up this particular model. In comparison, Hoadley alarm timepieces are pretty rare but I have owned several of them and seen many more. The mahogany case is very clean, refinished and the veneer is just about perfect. The upper glass and the mirror appear to be the originals. 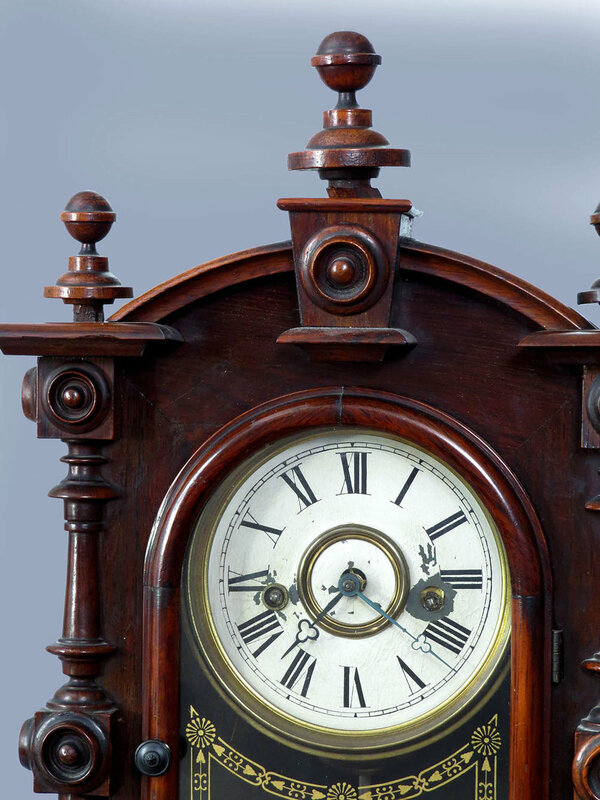 It has an early style painted wood dial which is in excellent condition. It has a large central opening so the customer could see that it had a brass movement which was an important selling feature at that time. The label is complete and very legible. It comes with the original hands, weights and pendulum. This is a 30-hour timepiece. The alarm works properly and it runs a short while for me before stopping. In the last photo you will see 2 clocks. The standard size ogee is only there for a size comparison. movement by Hills, Goodrich of Plainville, Conn. This company was only in business for four years from 1841 to 1845. 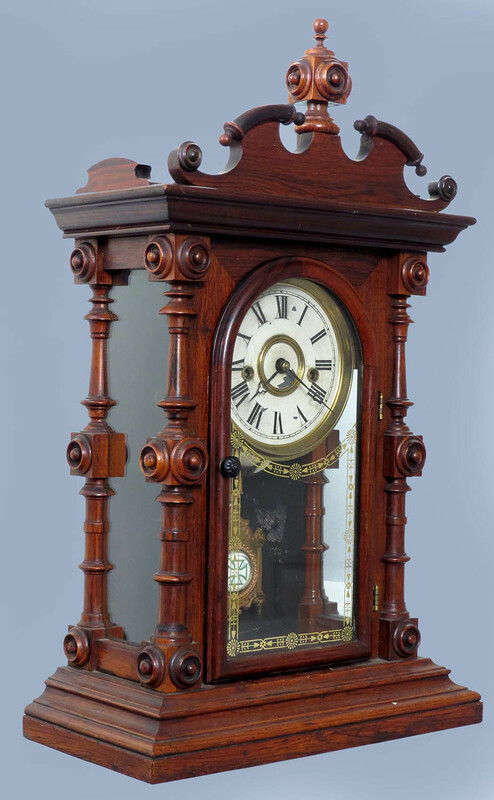 They made other notable clocks such as the large eight day model with mirrored inserts but all examples by this firm are pretty rare and sought-after. The mahogany case is in the original, dark finish and the veneer has only a few minor chips. Both glasses are the originals and the lower tablet has a reverse decorated balloon ascension scene. Note that there is a fair amount of flaking on that tablet. It has an early style zinc dial with large raised chapter ring and blue floral corners. The dial condition is quite good. The paper label is rather dark and has pulled away from the backboard somewhat but it is all quite legible. This clock comes with the original hands, pendulum and weights. 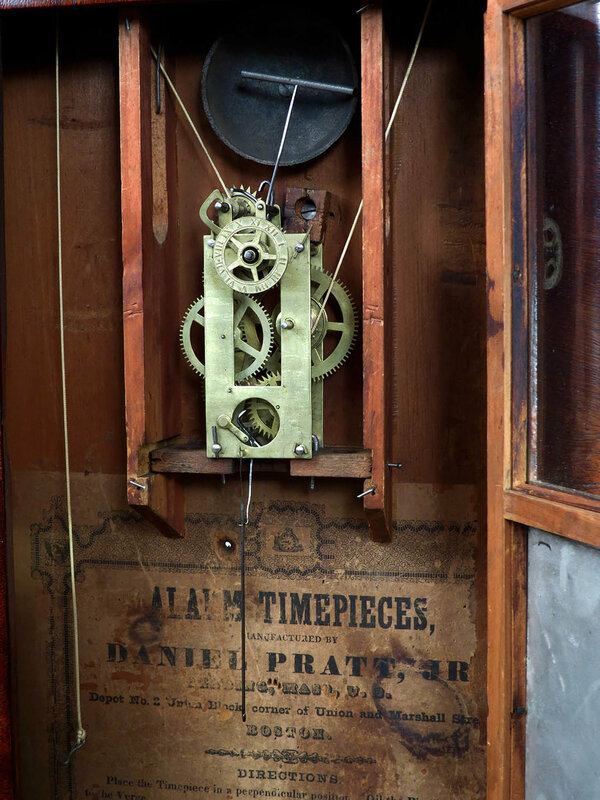 This is a thirty-hour brass movement clock with hourly strike on a gong. The movement is very clean and it is running. 9012 Fine, early Elisha Manross, Bristol, Conn. 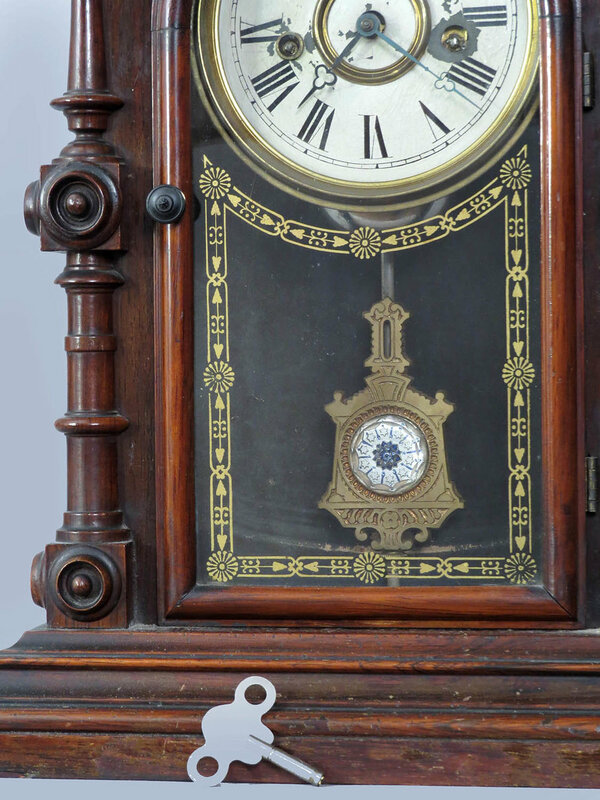 This is a great little clock in exceptional condition. It will be a worthwhile addition to any collection. The mahogany case has been beautifully refinished and has only a few very tiny veneer nicks. The best feature is a wonderful patriotic reverse decorated tablet which is painted and frosted. It features an eagle with a banner, arrows, olive branch, flags and 13 stars. There is a little wear in that tablet but overall it is quite good. The original painted zinc dial has a raised chapter ring and the numerals are all very crisp and clear. The label is complete and very legible. This clock comes with the original hands and pendulum. 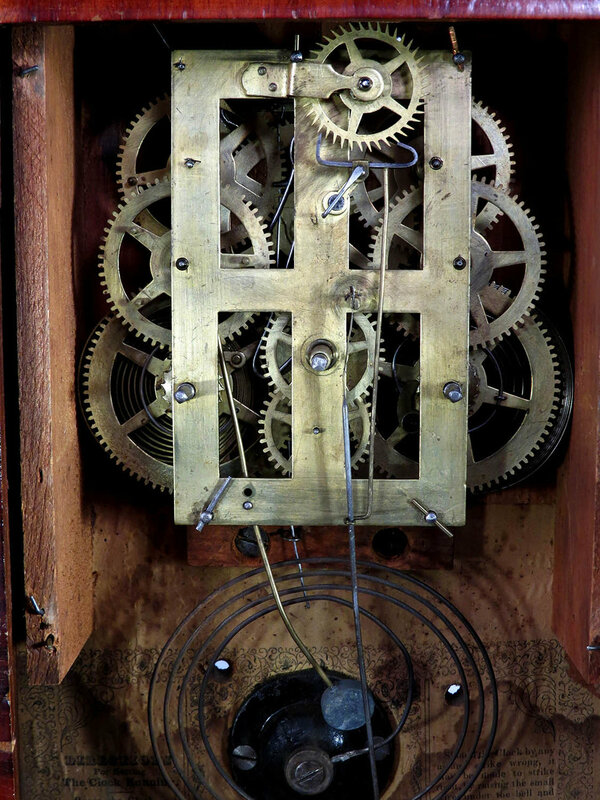 This is a 30-hour brass movement clock with hourly strike on a gong. It retains one original brass mainspring. It is running for me but the strike has a habit of getting out of sequence. 17 ½ inches tall. $225. 9014 Fine Welch, Spring & Co., Forestville, Conn. 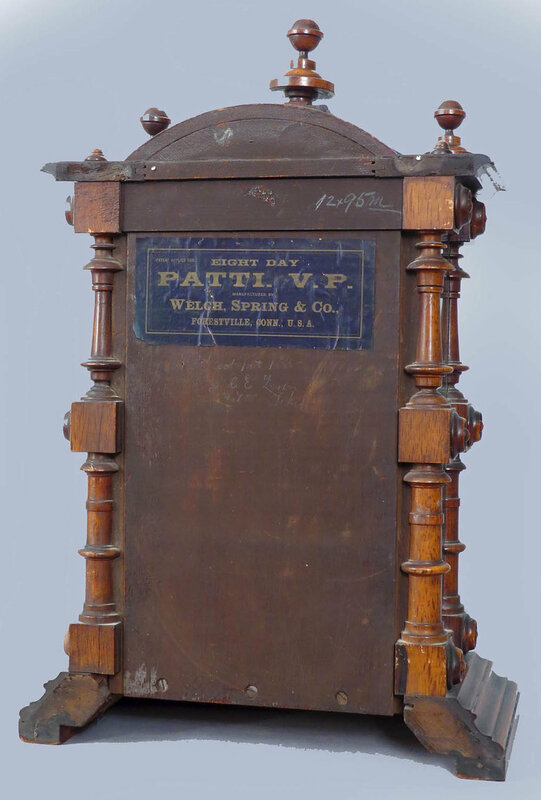 This clock is one in the the famous Patti series made in the 1880s. 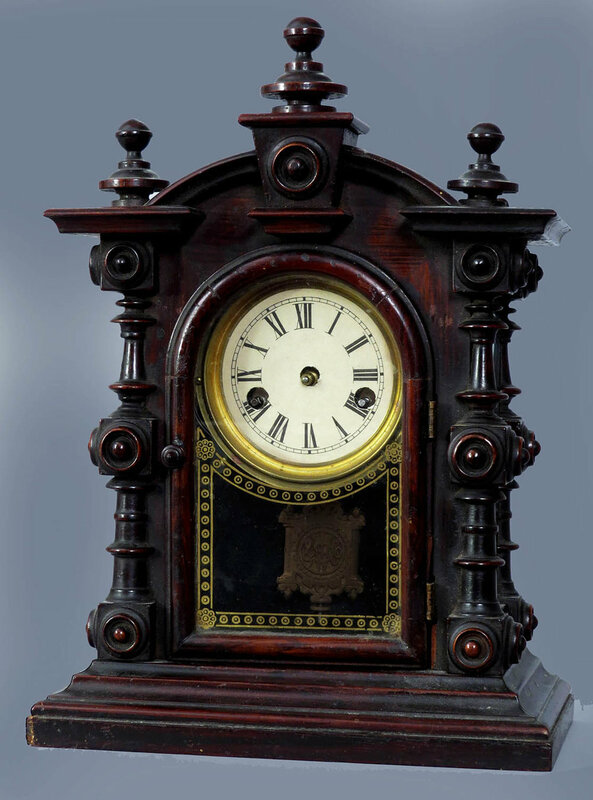 They were the Lexus of the clock market then and are still that well regarded today. The rosewood case is in superb condition with a clean original finish and no faults at all that I can see. It has obviously been well cared for all of its life. It needs no repair or attention and is ready for your shelf. All three glasses are original and there is no wear at all in the gold leaf door glass. The painted dial is the original and that paint flake that you see at the center is the only fault I could find with the entire clock and that could be easily touched up. 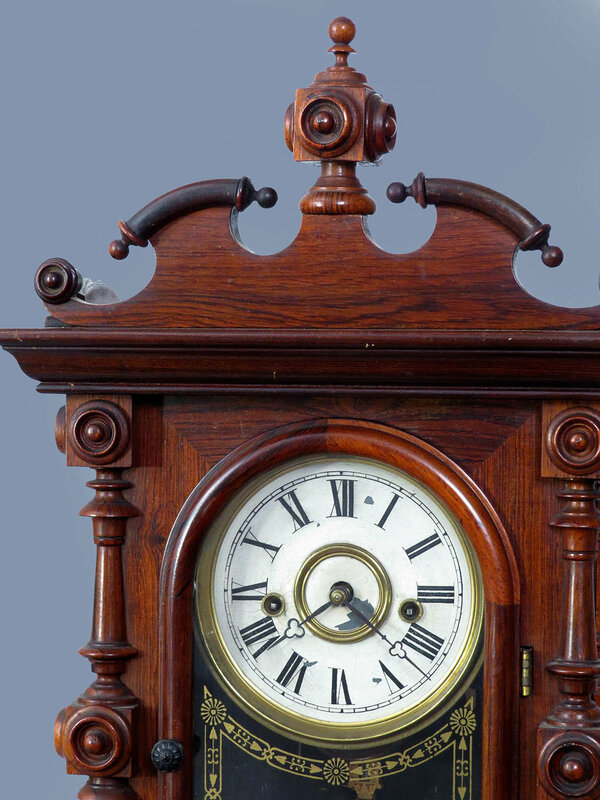 This clock comes with the original hands, black flocking on the backboard, a near perfect label and the fancy heavy, cast pendulum with glass center. This is an eight-day clock with hourly strike on a delicate nickel plated bell. It has been running well for me for several weeks. 9015 Welch, Spring & Co., Forestville, Conn.
Another in that famous Patti series. This rosewood case is in good condition but note there is chipping at the bases of all three top finials. The case is also dusty and it would benefit with some cleaning. There are no missing buttons or trim pieces. All three glasses are original and the goldleaf door glass shows no wear at all. It has the original painted dial. Note that the right winding arbor has some paint chipping and it is missing the grommet. The clock comes with the original hands, black flocking on the backboard, a virtually perfect label and the distinctive heavy cast pendulum with glass center. miniature or baby Patti – case only. This is a rare and very collectible model which, when complete, has always commanded a very strong price - in the several thousand dollar range. Hopefully someone can use this case to restore this clock to its former state. The rosewood case is in excellent, untouched, original condition. It has a dusty but original finish and there is not one missing, chipped or repaired trim piece. All three glasses are original and the gold leaf door glass is perfect. I believe the backboard is the original while the black flocking on the interior has been redone. The dial with pan is a replacement and there are no hands. I believe the movement is an old Welch movement from a small cottage clock which has been adapted to fit this case. The pendulum is a reproduction replacement and I think the suspension would need to be worked on if you wanted to put this in running order as it is while you search for an original movement. 10 ½ inches tall. $575. 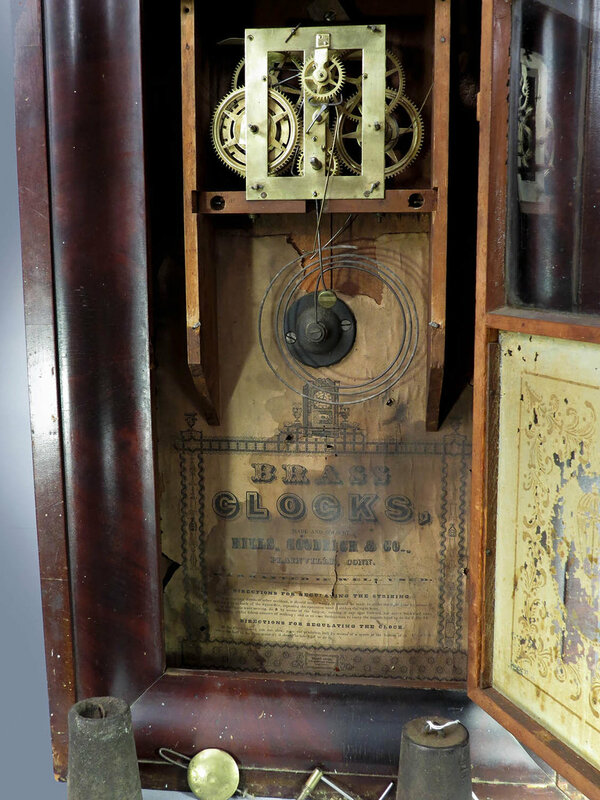 “Cary” parlor clock – case only. This rosewood case has an original, untouched old finish there are no veneer chips or broken pieces but note the two small rosette turnings on both ends of the top are missing. The center part that the top finial sits on has a replacement piece on the backside. All three glasses are original and the gold on the door glass is perfect. The backboard is original and it has a fairly good label but the black flocking on the interior has been removed. If you need a winter project to save a worthwhile clock, perhaps this is it. It is missing the top front veneer and the left side molding return piece. The rosewood grain painted columns have some small chips. The upper and center glasses are original but the reverse painting has largely flaked away. There is no lower glass. There is a good label, a very good, painted zinc dial, original hands, pulley covers and period pendulum. There are no weights. 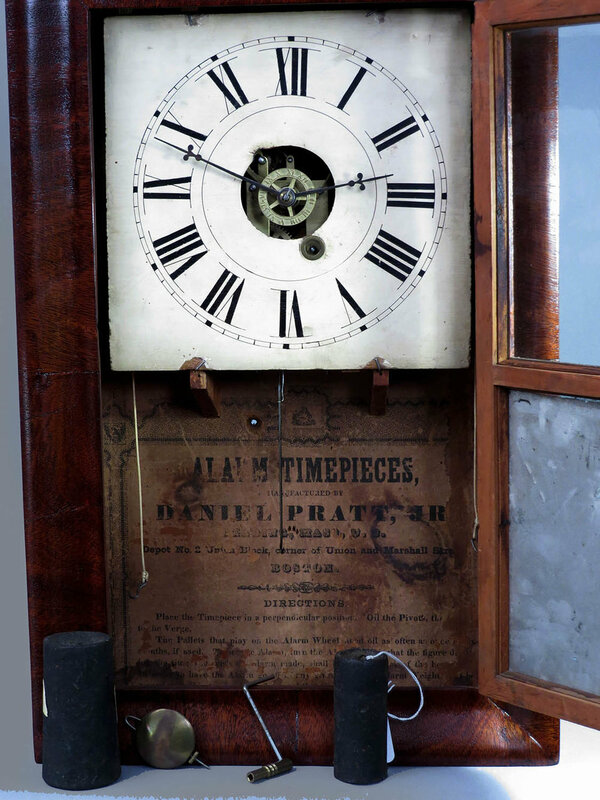 This clock has that large 8-day brass Seth Thomas signed lyre movement which is complete and appears to be in good condition. There is no shipping on this item so a pickup or delivery will need to be arranged. 6021 Seth Thomas eight day miniature ogee. Seth Thomas eight day miniature ogee. Usually these miniature clocks have 30 hour movements but this one is the more desirable eight day model. It has a polished mahogany case with the original finish. There are some veneer chips on the top edge of the door and case. The dial has been professionally repainted and it has a good label. The original stenciled tablet has largely worn away. The “ST” hands and the pendulum are the originals. 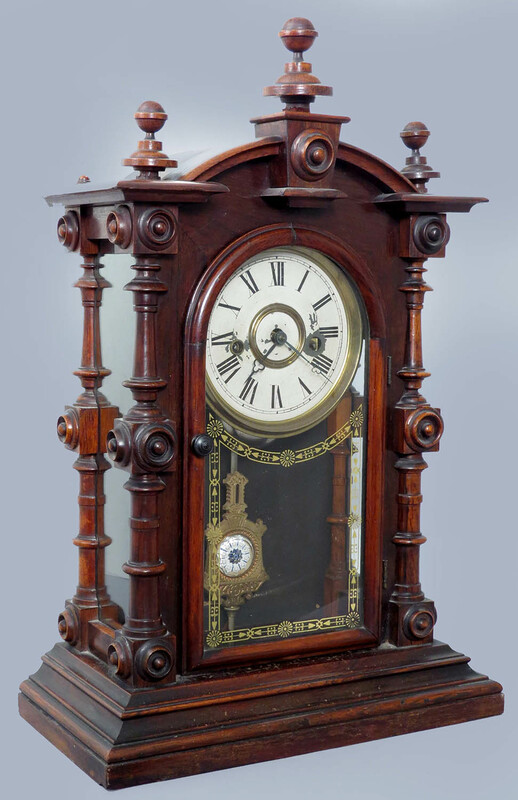 This clock has a signed eight-day lyre shaped movement with Geneva stops and hourly strike on a gong. It is running but is very dirty and long overdue for a cleaning.